​Way back in my February 2017 blog I told you all about the intrepid Green Tree Frog I found in my letterbox and about the painting it inspired called ‘Land Acquisition Order’. ​I ended the blog saying the story would continue in a couple of months. Emmm is that a typo? Did she really mean a couple of years? Whoops, how time flies. For many months now, I’ve been gently removing a number of tree frogs from my outside spa. These guys are not going anywhere in a hurry, especially since I’ve had to stop adding chemicals to the water in case I cause them harm. They are such gentle and mild beings and I love how they cling onto your hand looking all calm and collected whilst being transferred to a more suitable spot for tree frogs. Like a TREE. ​Anyway, this prompted me to continue the story from Land Acquisition Order and I imagined what the frog and spider might do after vacating their letter box in the town suburbs. Images of the intrepid duo flashed through my mind of them braving workmen and bulldozers as part of their journey or to finding their way to the inner city and facing the perils there. As a person who cares about wildlife you can get focused on man’s negative impact on our wildlife, but the poor buggers have their natural and imported predators to dodge as well. Hence the reason for my new painting ‘Out of the Frying Pan’. Our intrepid pair have found their way to rural Australia only to discover they have a whole new set of problems in their search for a safe abode and a happy ever after. 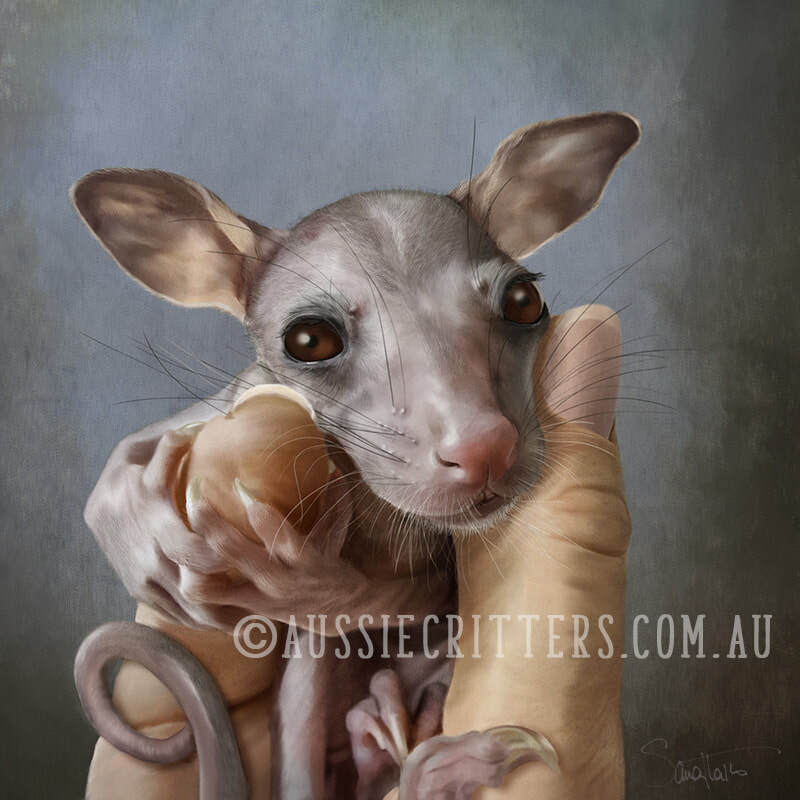 Not all that long ago I was inspired to paint a little possum pinkie called River who was cared for by wildlife carer Rhoda Earl. When I painted River I knew that he wasn’t going to be a popular print. How did I know? I’ve done other pinkies in the past and people just don’t want to buy those particular prints. Mainly because a lot of people can’t work out what they are. Sad eh? Other reasons vary from people thinking they are ugly and repulsive just because they have no fur. This always shocks me, especially since babies seem to be fairly popular among the human race and I know they don’t have a lot of fur. Anyway, like I’ve always said, I paint for wildlife first and foremost, myself second, and I never cease to be amazed by these beautiful trusting baby souls. 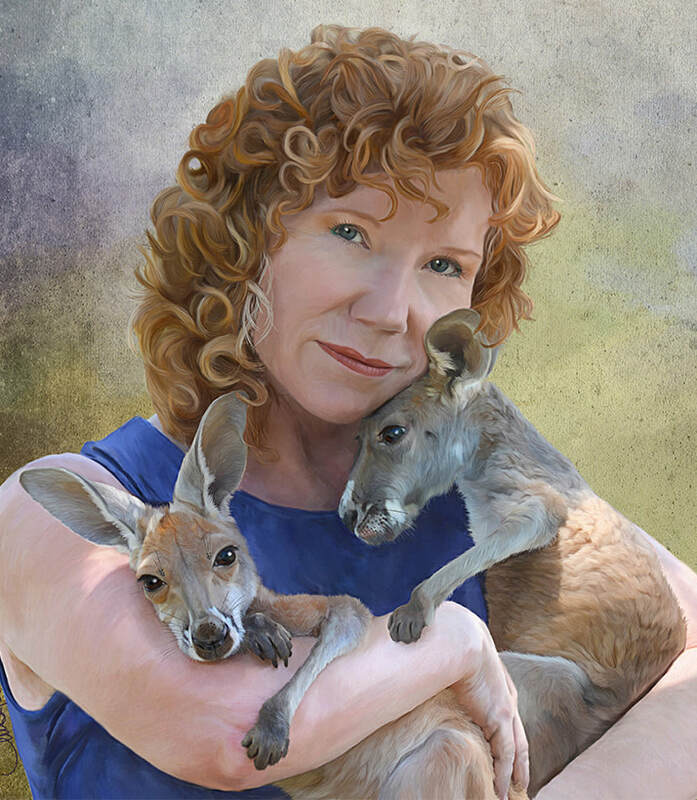 I loved painting River Rescue and felt I needed to paint a red kangaroo pinkie just because……..because I LOVE THEM SO MUCH. 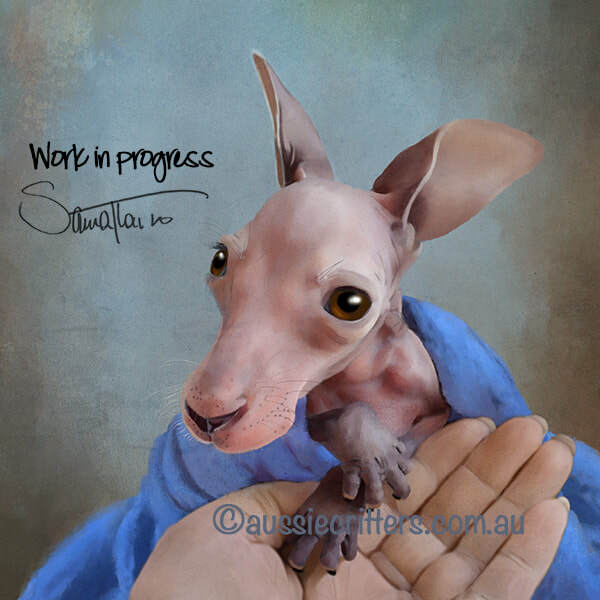 This piece features the first ever pinkie red kangaroo I had in care, she came in so very sick and dehydrated. She needed to be on antibiotic injections immediately, it broke my heart to give them to her because she was so very skinny and tiny. She was sick for weeks on end, but fought tooth and nail to live. So many vet visits, so many sleepless nights, so much heartache and I loved her to distraction. She is the blue red who features in my painting Hunting + [ - Habitat ] = Extinction. Bottom: 'River Rescue' Featuring River a Brushtail Possum. My local art society are organising an exhibition for the upcoming ANZAC day, so I thought I would like to create something as part of the exhibition. My artwork is not intended to be historically correct, my apologies. I’m an ex-pom so my historic knowledge of WW1 is primarily of the British fighting in the trenches of France. My heart belongs here in Australia and I feel massively humbled to be allowed to live in this beautiful country. My research on the ANZACs is sketchy at best, but my feelings are genuine for those that fought and have given their lives so that I have the privilege of living the wonderful life I do. When I started this piece I accessed the Australian War Memorial website, searching through hundreds of the photographs found there. One in particular caught my attention and it became the starting point of this work. Source: Courtesy of Australian War Memorial, Campbell, ACT. 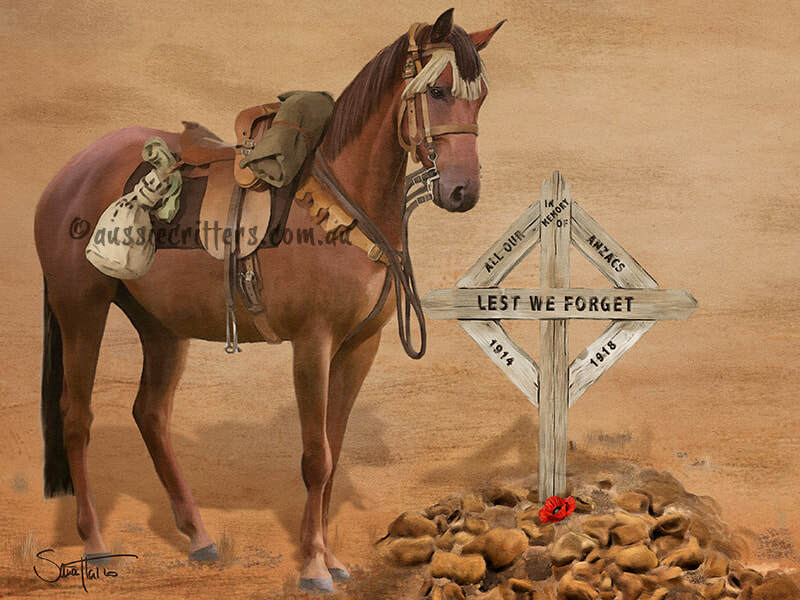 I then read that 130,000 horses were sent from Australia during WW1 and only one came back. Those that didn’t die during the war (around 13,000) were not permitted to return due to the tough stance taken by Australian quarantine officials. 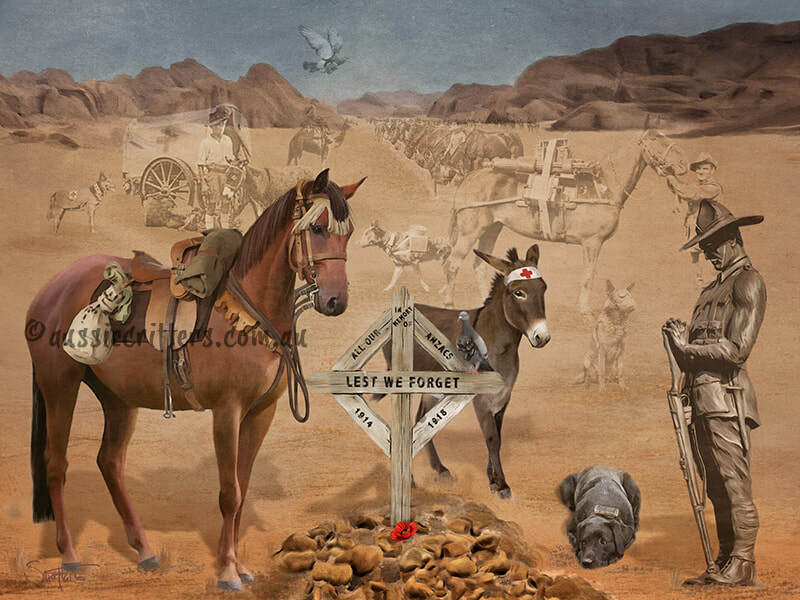 I began digitally painting the horse and the grave, because of the emotional impact the above photograph had on me. 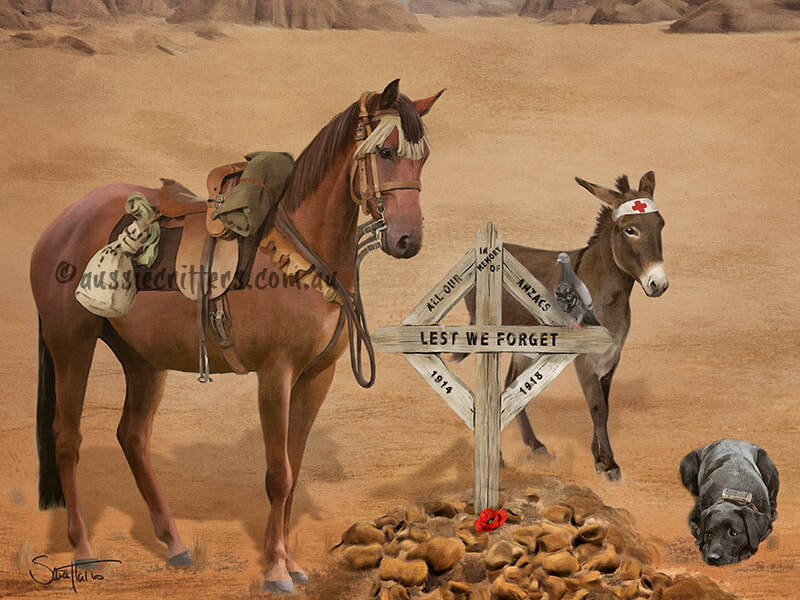 Then I thought of all the other animals used in the war and believed they needed to be remembered too. Dogs used for searching out the wounded on battlefields, donkeys and camels used to transport the wounded to the hospital tents. Dogs to lay telegraph wire, warn of enemy attacks, carry messages, pull tea carts, or just to provide companionship. Pigeons, I thought only carried messages, but no, they were also used to carry a camera to take aerial photographs. Horses and camels to move troops, carry packs, move heavy artillery. The list was astounding. Originally the finished work comprised only of the horse, donkey, dog and pigeon by the grave, but it looked wrong. It wasn’t telling a story. I then incorporated a number of images to help support the painting element. These images taken during the years 1914 to 1918 are of real people. I use them proudly, with the greatest respect for those who are in these photographs. It allows me to bring them back so that they can be remembered and honoured, just like all others like them. I thought I’d finally finished after including the images, but it felt unbalanced, although I couldn’t fathom it at the time. It was only when I thought to paint a likeness of the statue designed by Alan Somerville, for the ANZAC bridge monument that I was able to bring balance back into the work. 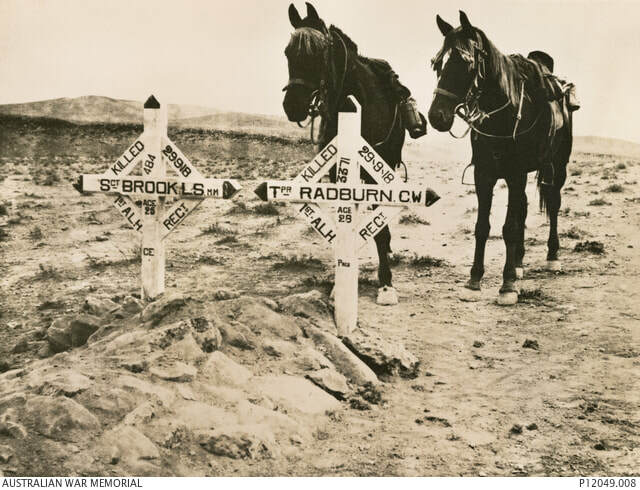 Images courtesy of Australian War Memorial, Campbell, ACT. Dog in gas mask, 25 January 2013, I know what you need… air of the dog! Dog laying telegraph wire, 9 May 2017, Animals on the front line. 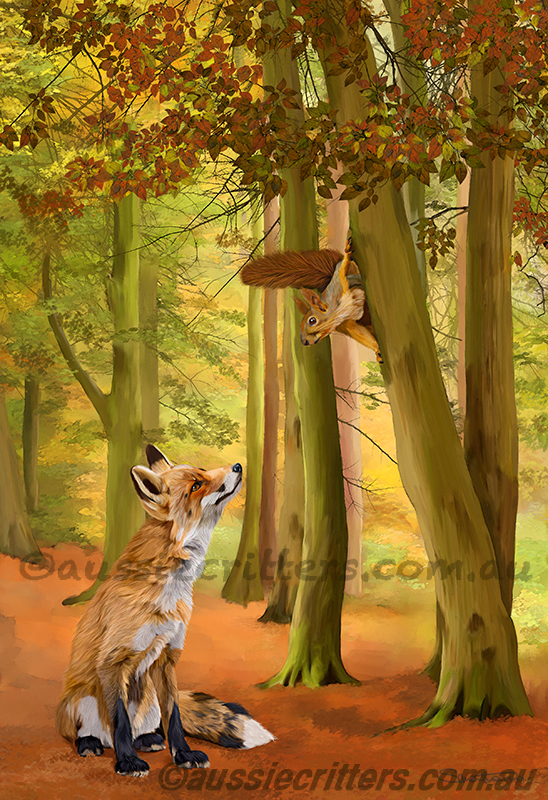 ​Do you love wildlife and critters like I do? Sign up for my new art notifications, special offers and discounts. Frequency 1-2 a month. Get 15% DISCOUNT on your FIRST order. I LOVE Critters take me to your sign up form...Click! ​I’m always in total awe that people out there hang my prints on the walls of their homes. In some small way I like to believe my work has made a tiny change in their life. To buy it in the first place would mean they have some emotional attachment to the piece and I just love that fact. I am emotionally attached to all my paintings and can get quite upset when the prints do not sell. So much so, I’ll just withdraw them from sale well before the set number of limited editions have sold. This is probably akin to showing friends and family one of my pieces and no one says anything or I get uninspired feedback. I just put it away in a drawer, GONE! ​An example of my hide in a drawer reaction was Orphan Serenade (Orphaned Red and Grey Kangaroos). I really loved the painting as so many features hit all the right buttons for me. Technically it was far superior to everything I had done before, the subject matter comprised of some of my favourite babies and it won People’s Choice Award in my home town. Not only that, it garnered 68,000 views on Facebook with amazing comments and seemed to be well received. However, not many people wanted it hanging on their wall so…… into the drawer it went. By far the painting I love the most is The Australian (Red Kangaroo). To date, I don’t think I’ve painted anything that tops that one. In the three years since I created it, my techniques have improved exponentially since The Australian. 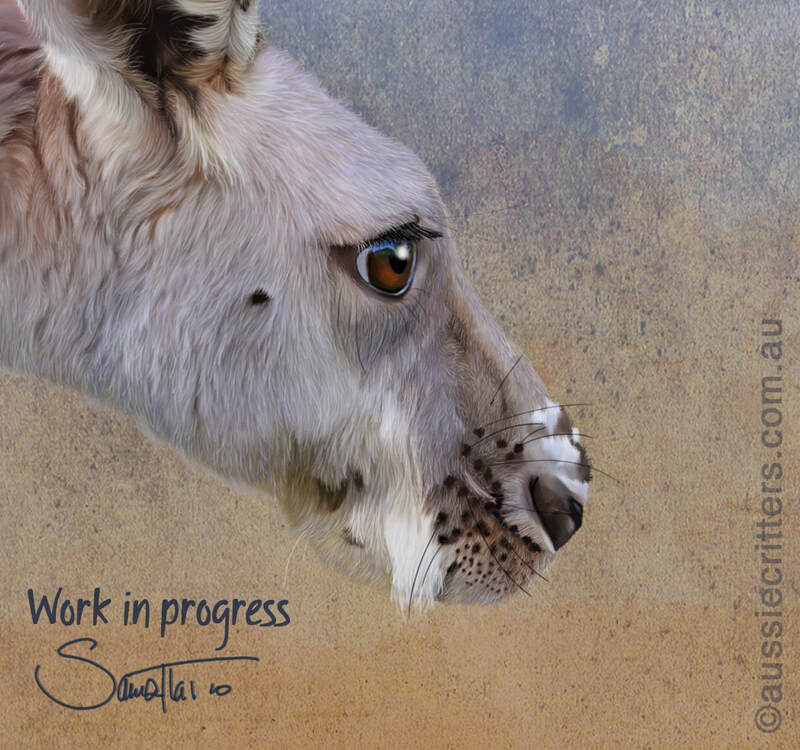 Painting what I feel are far superior pieces, such as Hunting + (-Habitat) = Extinction (Red Kangaroos). What do I know really? Ha! ​However, none of them have the effect on my heart like The Australian. Each time I look at it my heart swells and I even smile, I always feel that he looks after me. Funny eh? He’s over 1.5m wide and at great inconvenience, I will take him with me to art markets. This isn’t because I can sell the print, it just to make me feel better and more confident. Even I think that is a bit daft, especially when it is so difficult to get him into the car. I have another painting underway and I am extremely attached to already. 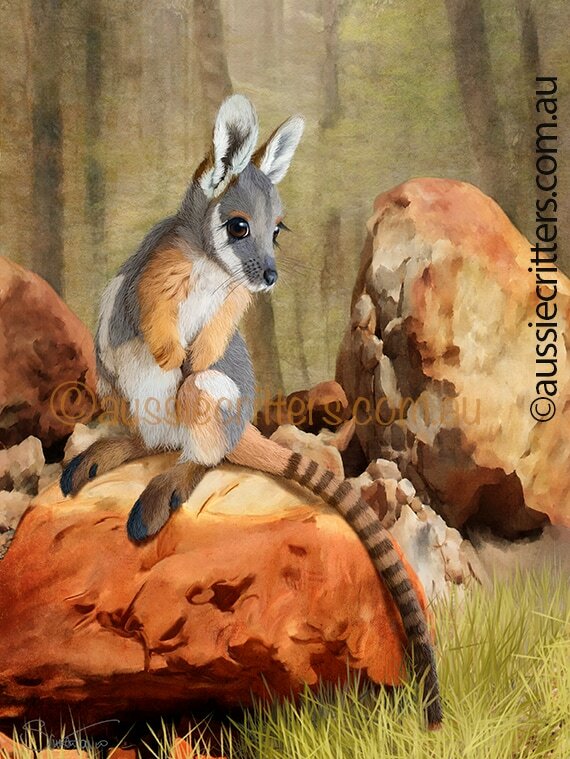 Technically it is far better than any painting of a kangaroo face I’ve done before and I am SO VERY EXCITED about it. Here is a taster of what is to come, I’ll share my journey with you during its creation, but for now it is just an introduction. Someone, please lock the drawers. 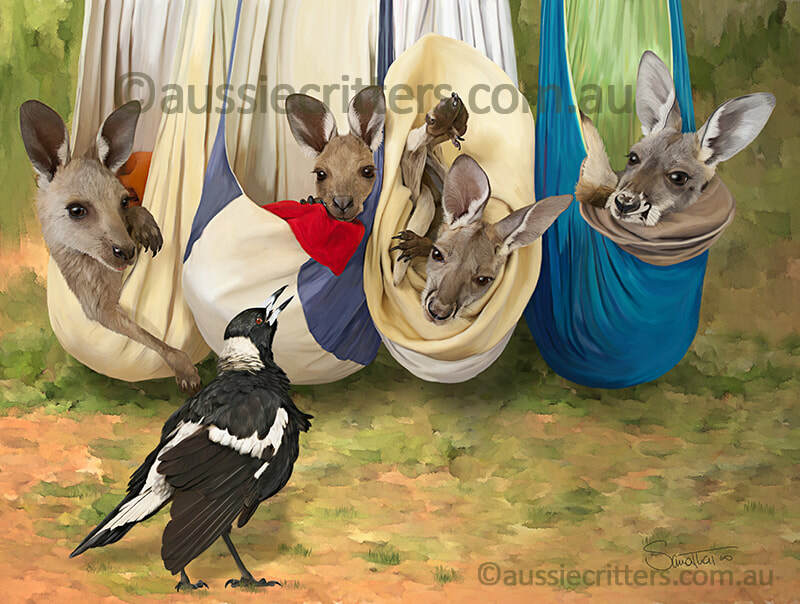 This is just part of an Australian wildlife painting I’ve been working on now for some time, well truth be told I started it 18 months ago, but it was another of my ‘child ideas’, meaning, I had to give it space to form and grow. The whole painting will be revealed at the end of this month and will hopefully be part of the Townsville Art Society's Exhibition in the Perc Tucker Regional Art Gallery in Townsville, Queensland between 1- 24th September 2017. 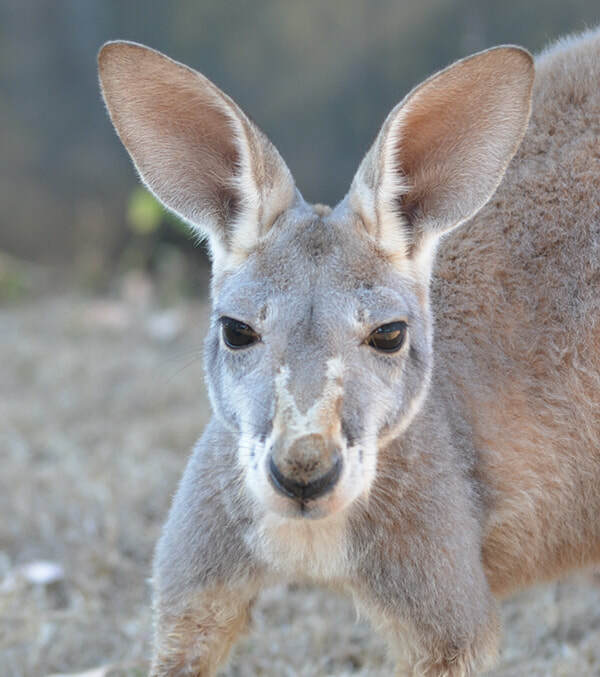 It features orphaned red kangaroos Ariel and Peri whose mothers were shot by hunters. 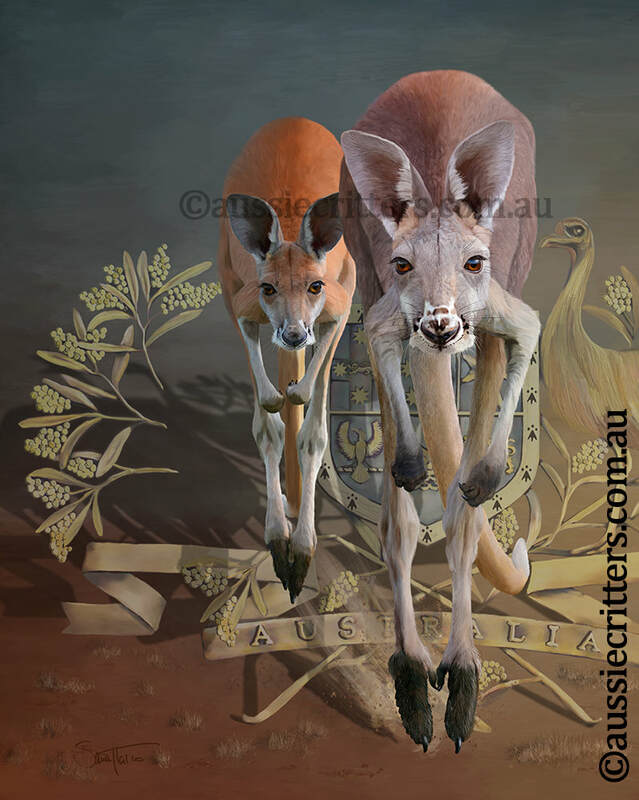 It is a painting from the depth of my heart, objecting against the legalised hunting of kangaroos in Australia. 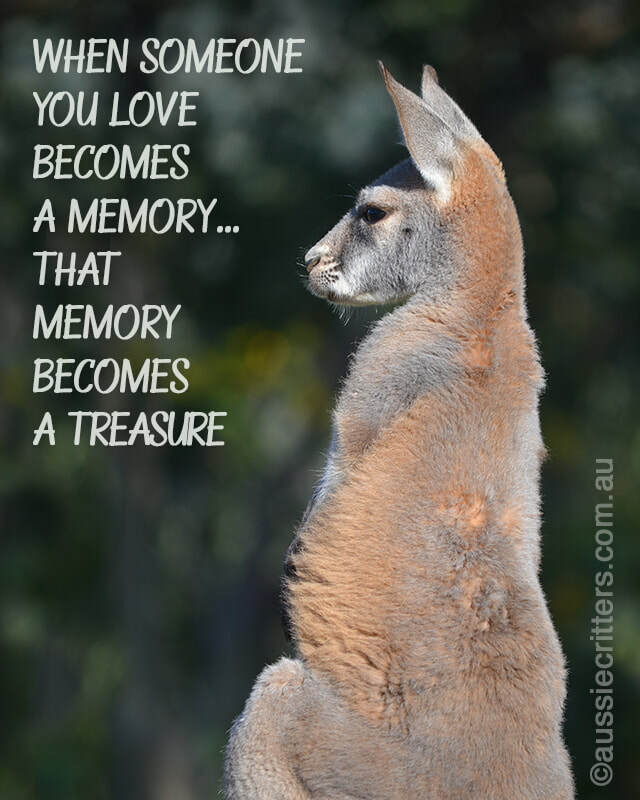 I find so many people that visit my art market stall or who speak to me in the art gallery do not know kangaroos are the victims of the largest land-based wildlife slaughter in the world. 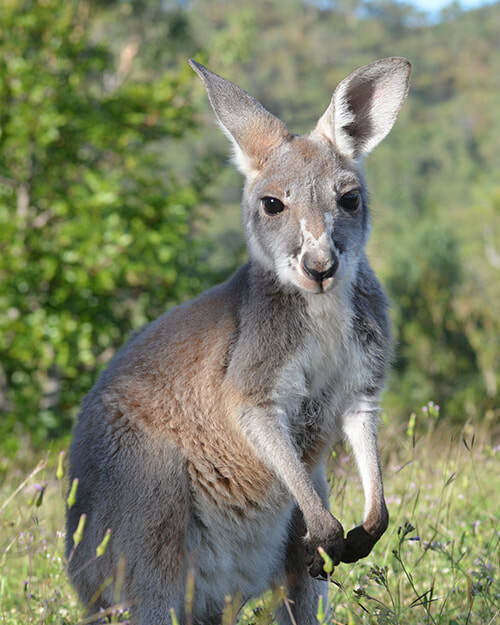 Every year the commercial kangaroo industry kills millions of kangaroos for their meat and skins which is sold to Australian and international companies and turned into pet food. I hope you will be interested in seeing the completed work in its entirety, why not sign up for my newsletter so you don't miss the big reveal? ​Often when I begin creating one of my paintings I either have a story in mind to tell, a picture I clearly see in my mind’s eye or triggered from a photograph. It’s a starting point from which the piece of evolves, either by enhancing the original idea or expanding into something I didn’t foresee. For example, the Battle of Maisondieu. Originally started as just a rat hanging from a sword hilt, but changed as I painted, not just by me, the female rat was added after comments from my Facebook friends. Now I’ve discovered a new perspective to consider via the ‘Intense Negotiations’ painting. Yes, I know the fox is much hated by Australians, but I’d tried to reach out to my European collectors for a change, showing these animals in their own native habitat. However, I’d pretty much given up on this piece months ago because I couldn’t feel its ‘heart’. I thought maybe it was because I wasn’t personally involved in the animals or story. Anyway, feeling guilty and in a moment of madness, I put it in my shop for pre-order, thinking I’d be motivated to finish it if someone bought it. Funny how the universe reacts…just a few days afterwards I had a pre-order. The universe eh? 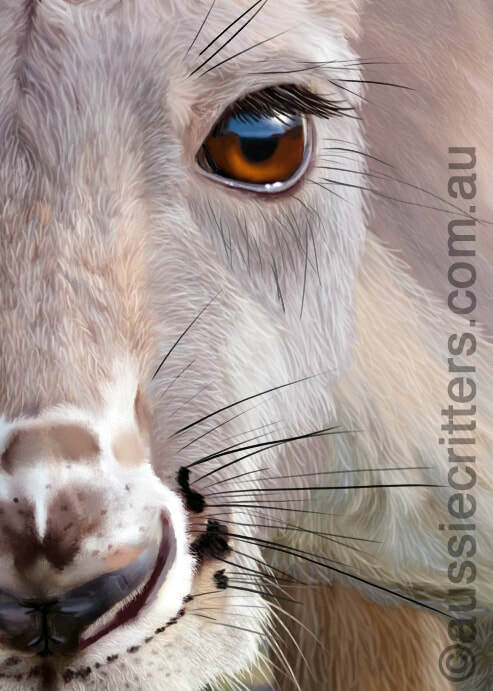 A lovely lady hailing from the US and usually a collector of my Aussie critters, turned out to be my inspiration. She had quite an impact on me when sharing her reasons of connection with the painting. The scene reminded her of the family home she was brought up in as a girl, her mother’s pleasure in feeding squirrels and also old times with her much loved Dad who had passed recently. She thought it would remind her of those good moments. She’d magically given the piece a heart and I was motivated not just to finish it, but to make the work even better. How extraordinary, I never really appreciated the different ways other people relate to my work. I may see something and think I’m telling a particular story, but others see the same thing and see quite a different one to mine. For me this experience has given me more freedom, in that I can create something that evolves without it always needing to make sense to me. I can just wait until you tell me what a particular painting means to you. You can give it the heart I’m always looking for.